Pick the "Right Light" for your subject! A key to great photography is to shoot in the right kind of light. 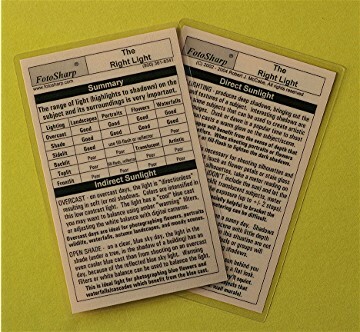 This 3.5" x 5.5" laminated cheat sheet discusses what subjects are good (or bad) to photograph in various lighting conditions, and how to best utilize different types of natural light.